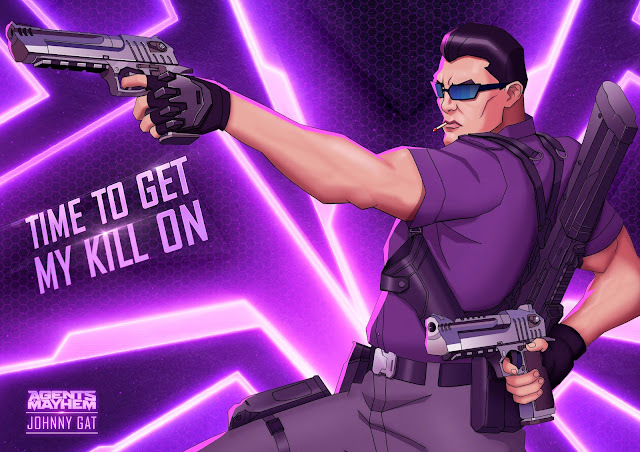 Unlock the one and only Johnny Gat when you pre-order Agents of Mayhem from GameStop. He just couldn’t stay away. Saints Row fans love him, Saints Row fans want to be him, and now they can. The “Have God re-create the Earth and retcon the entire world of Saints Row” ending of Saints Row: Gat out of Hell means that the dead don’t stay dead. Johnny is back where he was born – Seoul. Gat’s been hard on the beat in this universe as a Lieutenant in Seoul’s police department, but the tragic events of Devil’s Night left Johnny in a coma. After awakening almost a year later, Johnny discovers that all of the Seoul Metropolitan Police Agency have been wiped out and replaced with C.O.P (Civilian Overwatch Patrol) robot units. Johnny hates robots, loves guns, and his reputation for wanton destruction makes him the perfect fit for MAYHEM. Exclusively available to those pre-ordering Agents of Mayhem at GameStop, Johnny Gat will be the 13th Agent of Mayhem. Featuring an exclusive unlock mission, personal mission, vehicle/character/weapon skins, as well as the unmistakeable voice of Daniel Dae Kim, that’s a whole lot of Johnny.